Expansion to the number of coins defines this year's offerings of annual proof sets by the mint. 2000 US Mint proof set value chart includes three options of proof sets. Each set is described and imaged to identify and check its market value. Maintain your proof sets in as original condition as possible to increase their marketability. Should the time come to sell collectors are interested in coins still bright and free from hazing and spots to the surfaces. Additionally, handle the boxes and COA (Certificate of Authenticity) papers gently to preserve their crisp condition. Two plastic cases are included in the 10-coin 2000 proof set. Five State Quarters, Massachusetts, Maryland, South Carolina, New Hampshire and Virginia in one case. Each coin is separated from the other by an overall blue insert with an American flag graphic with white stars. Remaining denominations are encased in the other set. Lincoln cent, Jefferson nickel, Roosevelt dime, Kennedy half dollar and the newly introduced Sacagawea dollar. Each proof coin in both cases is the same alloy as the business (circulation) coins of year 2000. An image of the Statue of Liberty in shades of blue is on the box holding the two cases. Reverse side of the box is the US flag in blue with the US Mint Seal in white. 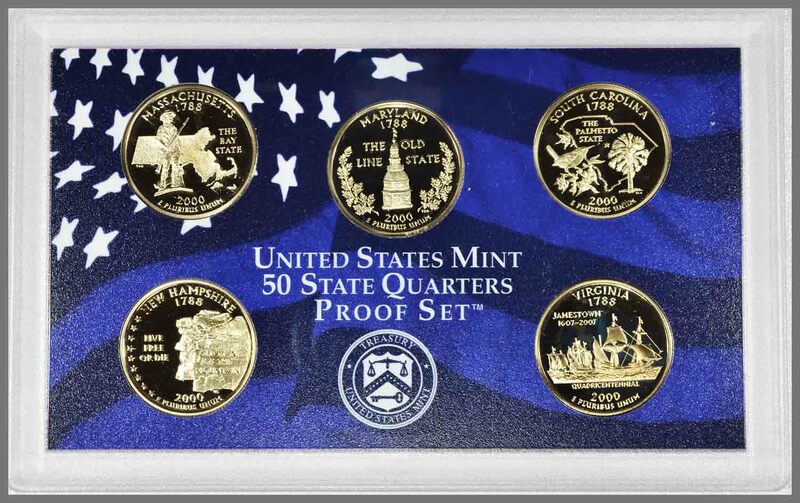 A separate five-coin proof set was produced to feature the 2000 State Quarters. One case with blue insert and the five State Quarter contained in an outer box. The plastic case with the quarters is the same as in the two case 10-coin set. An eagle is featured on the outer box with an overall blue theme to the colors. Reverse of the box is a map of the US in silver along with a listing of the state quarters in the set and the year of Statehood. Presentation and packaging of the 2000 10-coin silver proof set is now a red color scheme. 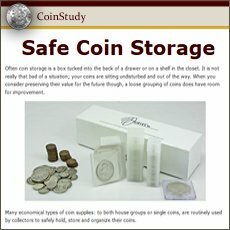 Two cases house the coins. State Quarters within one case; a solid red insert obverse and with an American flag reverse in shades of red with white stars. A second case with five denominations (cent-dollar) with the American flag graphic in shades of red as the obverse insert. A solid red insert is the reverse. Each of the proof State Quarters is struck in 90% silver. Dime and half dollar is 90% silver. Remaining denominations are of their standard alloy. Silver 2000 US mint proof set value is supported by its base silver worth. Currently 4/22/2019 silver is in the $14.99 range. A silver content value of $20.06 is part of the 2000 proof value presented in the chart. In the second year of the 50 State Quarters program five additional specially designed quarters were minted. The silver 2000 US Mint proof set value in 2019 is in the $38.60 range. Five unique state quarters are part of this set. Superimposed over a frosted outline of the state of Massachusetts is the Minuteman of the American Revolution. This well detailed engraving is faithful of the original statue located in Minute Man National Historical Park, Concord, Massachusetts, erected in 1875. Star on the Massachusetts outline is the location of Boston, the park is just 18 miles outside. Set between White Oak leaf clusters is a fine rendering depicting the Maryland Statehouse located in Annapolis the state capital of Maryland. An inscription above the Statehouse reads "The Old Line State" a nickname given to the state. This reference to Maryland was given in honor of the actions of the Maryland 400 Regiment during the Revolutionary War. George Washington is cited as referring to the Maryland units of the military as the "Old Line". In the background of the design is an outline of the state with a star pointing to the location of Columbia the state capital. A well detailed Carolina Wren is perched within Yellow Jessamine flowers. To the right is the Palmetto tree, a symbol for South Carolina since the Revolutionary War. Depicted in great detail is "The Old Man of the Mountain" once a natural rock formation in the White Mountains of New Hampshire. It became the state emblem in 1945 along with the state motto "Live Free or Die" displayed in the field. Three English ships sailing towards America are finely engraved and deeply impressed onto the reverse of the Virginia State Quarter. These ships the Susan Constant, Godspeed and Discovery historically depict carrying settlers on their journey and establishing Jamestown. 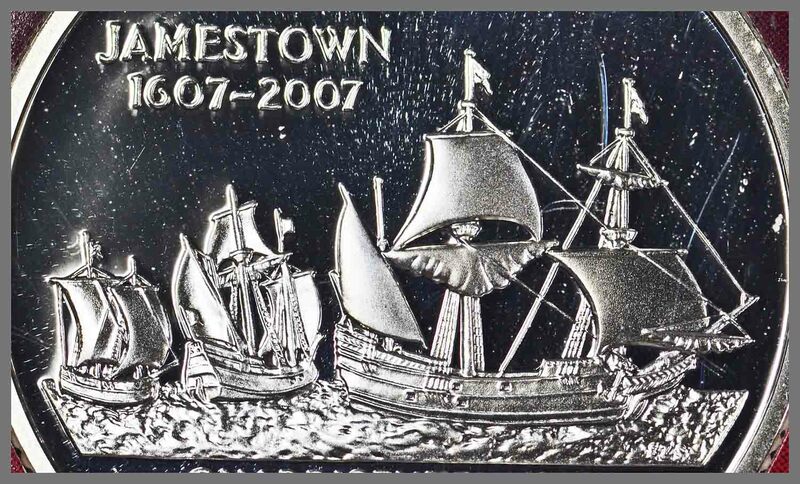 A historical time 1607, the founding of Jamestown. Designer Edgar Z. Steever rendered the arrival of the three ships bringing the colonists to America. Largest of the vessels the Susan Constant is well detailed including fine rigging of the sails. Godspeed and Discovery are well represented with billowing sails. Addition of the Sacagawea Dollar certainly helps support the 2000 US Mint proof set value. Now containing an impressive ten coins in all. The dollar's size 26.5mm, larger than the state quarters and providing space for the impressive portrait of Sacagawea. A golden color to the coin is the result of an outer layer of manganese brass. Inner metal of pure copper is bonded to a top and bottom alloy of 77% copper, 12% zinc, 7% manganese and 4% nickel. 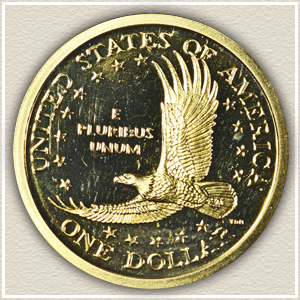 Reference by the mint to the coin as the "Golden Dollar" refers to the color only, no gold is within the alloy. Interestingly the edge of the coin is smooth similar to the nickels and cents. Manganese brass does tone overtime when exposed to the elements. 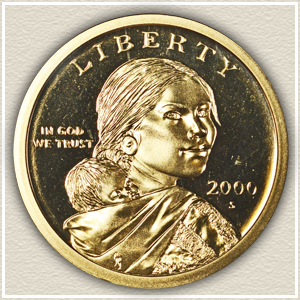 The delicate and ultra-smoothness of the proof Sacagawea dollar is protected by the original case. A coin still bright and lively without any haze to the surface is a coin remaining in Gem Proof condition. As new US coins are introduced into circulation the first of year examples are important to collectors. The 2000 Sacagawea dollar enjoys this status. Proof examples of the coin also benefit from this underlining demand. Interest in the 2000 silver proof set is reflected in is market value. Silver alloy examples of the dime, half and state quarters combine with the new Sacagawea dollar support this price. Inspect the silver coins to confirm a bright, haze free surfaces. Also, maintain all of the set, including the box, intact and handled gently. Future collectors will appreciate your efforts. Modern proof coins offered by the mint in sets began in 1955. These have become popular with collectors. US Mint proof sets values from 1955 to the present are listed and described on the chart. Additionally, all US coin values. Identify your coins using the image links leading to value charts. Important points to value are considered: Date | Mintmark | Condition - each described and imaged within their series. Surprising value is found in the smallest of detail.